Several years ago, I was driving through Utah on my way to a family reunion. Having never been in the state, I was awestruck by the beauty and the majesty of the landscape. Mountains and canyons and old bridges and blue, blue skies on a sunny July day. Over and over, only half aware of it, I would start to sing the first verse of a song that I sometimes sing when I encounter grandeur in nature. The truth is, How Great Thou Art isn’t really even one of my favorite hymns. I don’t hate it but I don’t think of it as a song that resonates for me. And yet, here I was driving through Utah and I couldn’t get it out of my head. I also couldn’t get it out of my head when I saw snow capped Mt. Shasta for the first time. Or sometimes when I walk through Central Park. At that particular time in my life, church and God and religion were something that I felt very far removed from. It was almost vexing that an old-fashioned country church hymn would be so fixated in my subconscious. While I grew up in the church, it was not who I was in my adulthood. But as I drove through Utah, I tried to give myself some grace. I tried to just enjoy the song and the singing of the song, sung at the top of my lungs, no less. I’ve written about it before but a couple of years ago, I embarked on a journey back to church. Not the same faith of my youth, I don’t think anyone ever holds on to that, exactly. But I found a church that accepted the LGBTQ community and preached about social issues that I care about and told me that all those questions and doubts I’ve always had about God and Jesus and the Bible and Christianity were welcome too. So I joined that church and then about a year later I stopped going. Somewhere down the road I might write about it but, put succinctly, I stopped going to that church because even after a year, no one knew my name. I share that, not to ask for anyone’s sympathy, but only to illustrate that many people have any number of reasons for going to church and any number of reasons for leaving it. Yesterday, in an effort to take a break from getting into political fights on Facebook, I asked the question, “What is your favorite hymn?” And I asked people to elaborate if they were inclined to do so. While I was slightly surprised by how many people responded to the question, I was not shocked by the answers themselves. The classics like In the Garden, The Old Rugged Cross, Amazing Grace, Great is Thy Faithfulness, Ave Maria and of course, How Great Thou Art all made multiple showings. As I imagined, so many favorite songs had memory tied to its resonance. Beautiful stories of grandmothers and grandfathers, weddings, funerals, parents, siblings, children. I know this sounds corny, but it was an honor to read these paragraphs about some of my friends’ most indelible memories. I wondered why I had even posted this question, was I trying to write a blog? If so, what was it that I wanted to say? I didn’t know. I feel like I understand where Scott is coming from. We both grew up in conservative evangelical homes. We both tried to be straight but came out eventually. We both spent so much time in churches singing songs and listening to sermons and participating in classes and these experiences, in part, have molded the men we are today. Not everybody goes to church. Not everybody that grew up going to church still goes to church. Church is responsible for many good things and also responsible for some bad things too. I am not here to make a case for religion. But I do want to say something, and I must confess, it’s a lesson that took me a few decades to learn. If you have a song, whether it’s Sia or George Jones or Tchaikovsky or a song about Jesus that you sang when you were a child, if you love it, that song is yours and it will always be yours. Nothing can change that. Inspired by Scott, I have posted a YouTube video of a British (I think) boys’ choir. A quick search led me to many renditions, even one by Elton John, but this is the one that moved me most. Young children singing about the promise of love and support. I pray that they will grow into adults who always, their entire lives, know that Love. On Sunday, Eric and I took a day trip to Santa Barbara. We visited the Santa Barbara Museum of Art and, while it is partially closed, we thoroughly enjoyed the pieces that are currently being exhibited. 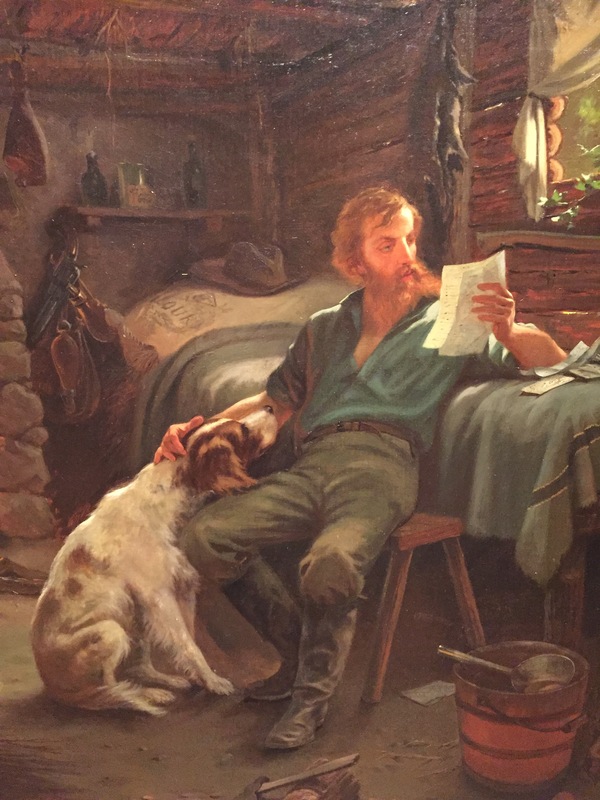 My favorite was a painting of a gold rush miner sitting in a small cabin, his dog nuzzling him. The young man reads a letter, and the dog stares lovingly at him. No surprise that it was my favorite. I read the placard on the wall. The artist Ernest Narjot, until yesterday unknown to me, had been a young man who was part of the California gold rush. In fact, apparently, the gold rush is what inspired him to leave his native France and go west. When I got home, I googled this painting in hopes of finding a crisper image. I couldn’t find one. What’s up, internet? What I did find were a few more biographical details about Ernest Narjot. How he wasn’t exactly the most successful gold rusher. And how now, many decades later, he is most known for his gold rush paintings. AND, most of his gold rush paintings were done in his later years, with a nostalgic element prominent in those works. It’s certainly here in this lovely portrait. He painted The Forty-Niner in 1881, when he was 55, a middle aged man looking back on another time. Time flies, I know. Seems just yesterday, I was a young man leaving my own home and traveling far away in my own hopes of striking another kind of gold. 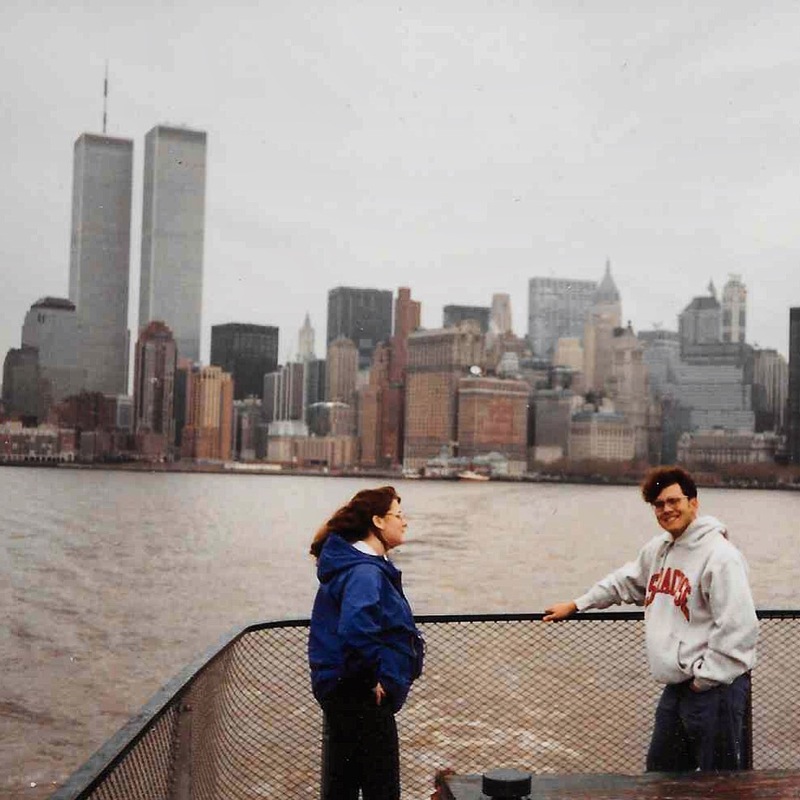 Because today is September 11, I searched my old photos to find an old picture of me with the World Trade Center in it. I found a picture from 1991, from my first visit to New York, on a trip where I fell in love with the city the second I crossed the Holland Tunnel. I was on a mission trip with my Bible college. I wanted more than anything to live in New York but I didn’t know if I would ever be brave enough to make such a big move. Clearly, it was a grim day, all clouds and some rain, but still to me, paradise. Less than a year after this trip, I was living in New York. There is a part of me that will always feel that the day I moved to New York is the day my life started. So, today, on September 11, I reflect on the great tragedy of that day, the lives lost, the people affected in New York and Washington and Boston and everywhere else. We say we will never forget and I hope we never will. 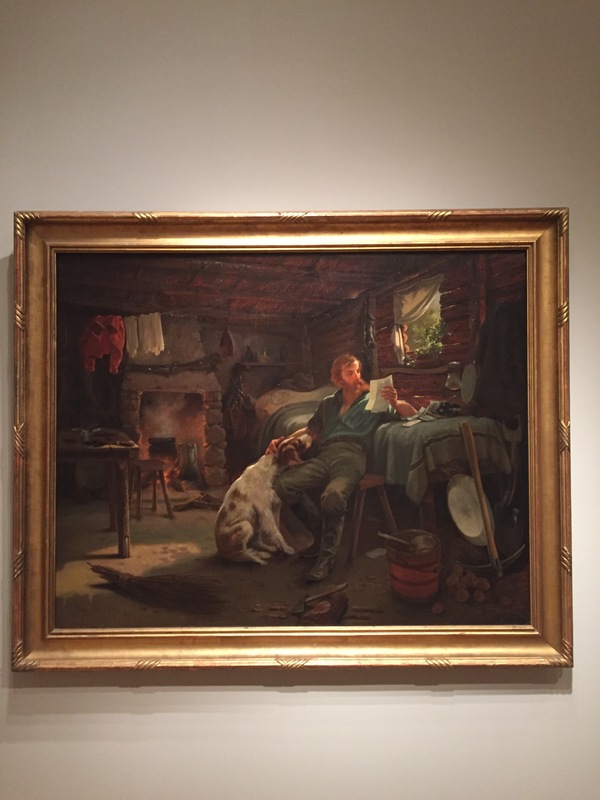 But also, on a lighter note, I reflect on young Ernest Narjot who in 1849, left his own version of Kansas and moved to his own version of New York and then, eventually, created beautiful paintings that touched the hearts of wayfarers (and dog lovers) for years to come. Several days ago, I asked a few friends to write guest blogs about this divisive, explosive election. One of the people I asked was my good friend Ab Kastl, who, like me, grew up in the same part of the country, went to Ozark Christian College and has lived in Southern California for over 20 years. So, we share many of the same influences if not the same perspectives. We often disagree politically. But he was glad to offer his reflection on the election, why it went the way it did, and also what his hopes for this country are. If you are led to comment, whether on here or on Facebook, in agreement or disagreement, I do ask that your comments be respectful. And if you are inspired to write your own guest blog about this election, by all means, I’d love to hear from you. “What has happened to the USA?” asked my good friend from England…the same England that voted for the Brexit. What made them vote for the Brexit? What made the USA vote for Trump? Being from Oklahoma, I hear the grumblings of so many out there in the Mid-west. Oh, stewardess! I speak redneck. There is a sense by so many in the fly over states of things being out of control (borders, spending, security, etc.….out of control). Allow me share what I passed to my friend who lives across the pond in the country where they love showing off their politeness by excessive queueing. 1. Bernie Sanders really got screwed. The emails showed the Democratic Party cheated him to push Hillary through. Debbie Wassermann Shultz got the boot because it was clear they sabotaged Bernie. So many are frustrated that he got screwed it was too late to change anything so they had to go with Hillary. So many who were disenfranchised with the system being out of control probably did not go vote for Hillary. 2. Hillary has more baggage than (name your 3 favorite airlines here). The Midwest folks are military loving diehards. The Benghazi attack on 9-11 was four fresh year ago. That it happened on the anniversary of 9-11 and Hillary Clinton did not respond properly and then blamed a YouTube video puts a bad taste in a lot of people’s mouth. Then she went the extra mile to erase anything related to it while she was under subpoena doesn’t look good. Destroyed computers and phones equals shady biz. One of the silliest lies she told a while back was sharing a false story in a speech about landing in Bosnia under sniper fire (remember how people were turned off when Brian Williams said such things?). She went into specific details and they were all lies. I know it seems like it is no big deal but it does show the extent she is willing to go to lie on something that is not even controversial This is not good when you are trying to get some good ole boy famer out in Iowa to show up and vote for you. 3. The Obama family wins in the “Classiest Looking Family” category. President Obama was not as strategically successful as we hoped. Obama’s health care plan was forced on the American public with zero support from the other side. The numbers did not add up but he did not care…he forced it through. We were told to pass 20,000 pages of confusion and then we will see what is in it. His cabinet begged him to go golfing with people from the opposing side in order to find some common ground. He refused. Instead of doing the necessary leg work all presidents have to do to find compromise, President Obama said “Elections have consequences. I won.” He told the other side they had to “sit in the back of the bus.” Recently, health care rates are starting to double and many, including Democrats are upset and concerned. This probably motivated a lot of the middle of the road voters to go another way. 4. Immigration feels out of control here. Immigration is the backbone and pillar of America. There has to be limits, rules and lines. Way back, Ellis Island was the first stop for so many. Everyone understood that is part of the process. Not anymore. In a land of many laws, breaking the law as your first action here does not sit well with many. When so many show up, who’s jobs get taken away? Remember that 70’s movie Car Wash? African Americans dominated that works force in the 70’s….not anymore. So many jobs African Americans filled are now filled by our neighbors from the South. More black people voted Republican (Trump) than ever before. 30% of Hispanics voted for Trump. Why would they? Maybe because they have seen what it is like to live in countries that are out of control. Trump definitely tapped into Americans feeling out of control. 5. The media here does slant a certain way. This upsets the people named Jim Bob and Genevieve. That is why they are so loyal to Fox News….They like Fox because they get a sense of balance and control in a topsy-turvy feeling world. Michigan, Wisconsin, Iowa, Pennsylvania and Michigan strongly voted for President Obama last time but went for Trump this time (Some say this shows the statement “Everyone who voted for Trump is a racist.” is false?). Those are hardworking blue collar states. So, Trump yelping about creating jobs sounds appealing to these states. Americans don’t want to feel so out of control. I try not to cuss at or around my two kids. I am no goodie-goodie. I just remember as a kid the adults who never cussed and then all the sudden they wanted emphasis would slipped in a cuss word and BOOM, they have my attention. I knew they meant business. I knew I better sit up, pay attention and focus on what they wanted done. But the coaches, old bosses or relatives who cussed at me all the time and everyday…Yawn….same old same old. Who cares what they say? No one really. The same could be said of people who are so quick to call other people who they do not agree with “racists”. The broken record gets ignored. I know Trump said some bold things that have been interpreted as racist. Calling someone a racist no longer has any power or effect. Every Republican has been accused of being a racist. George W Bush was called a racist for not helping Katrina victims fast enough. McCain was called a racist because he questioned President Obama’s black pastor Jeremiah Wright and he referred to Barak Obama as “that one”. Romney was called racist because he used “dog-whistle” language like “free stuff”, “welfare” and “Chicago”. Now, anyone who voted for Trump is being called a racist. It is so overly used it has no effect. It pushed people to vote against the accusers even if the person they are voting for is a mess. Not everyone who wants a controlled borders hates Mexicans. Not everyone who questions climate change is anti-science. Not everyone who did not get excited about President Obama is a racist. To be accused of these things creates that feeling of a society out of control. If you accused others of such things….maybe you helped Trump get elected? I told myself before the election “Whichever way it goes, the USA will be just fine.” We have a system that has checks and balances. If Trump or Hillary wins and is a mess, we will give them the boot in four years. Like it or not, we have some of that deep English heritage intertwined in the DNA of the USA. Deep down, we crave those organized queues. We know we have a good thing going here and to have that sense of chaos is unsettling. Things were feeling out of control. Maybe 2016 was just a sloppy shake up to try to get us back in queue.